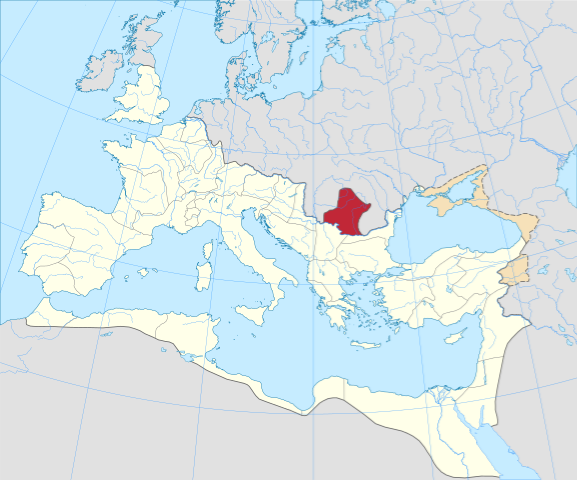 Dacia was a province of the Roman Empire from 106 to 274–275 AD. It was from the very beginning organized as an imperial province, fitting a border area, and remained so throughout the Roman occupation. The Roman authorities undertook a massive and organized colonization of Dacia. New mines were opened and ore extraction intensified, while agriculture, stock breeding, and commerce flourished in the province. Dacia began to supply grain not only to the military personnel stationed in the province but also to the rest of the Balkan area. It became an urban province, with about 10 cities known, 8 of which held the highest rank of colonia, though the number of cities was fewer than in the region's other provinces. AE unit Ulpia Traiana (Dacia)?